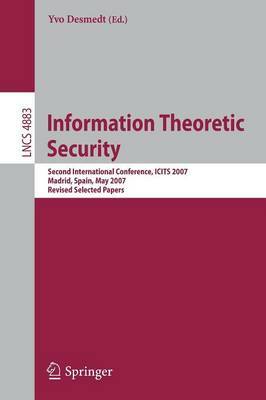 This book constitutes the thoroughly refereed post-conference proceedings of the Second International Conference on Information Theoretic Security, ICITS 2007, held in Madrid, Spain, in May 2007. The 13 revised full papers presented in this volume were carefully reviewed and selected from 26 submissions. There were one invited keynote speech and 3 invited talks to the conference. The topics covered are authentication, group cryptography, private and reliable message transmission, secret sharing, and applications of information theory.